From an early age, John Mullan had big visions for his future. Born in 1830 in Maryland, Mullan graduated from St John’s College in 1847, and from West Point where he studied engineering. Soon his skills and military training were tested in the vast wilderness of the northwest. In 1853, Mullan joined Governor Isaac Stevens in a survey effort to find a suitable rail route for a northwest passage from St. Louis to the Washington Territory. This survey, the first of its kind since Lewis and Clark fifty years earlier, boasted a wide variety of specialists including astronomers, meteorologists, and artists like Gustavus Sohon. 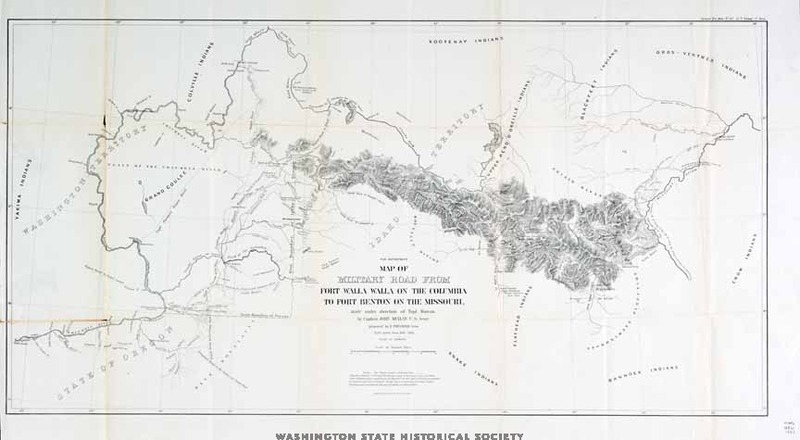 Not only did the Stevens Expedition establish several navigable overland routes into the Pacific Northwest, the description of vast resources and tribal conflict prompted demands for a strengthened military presence in the region. 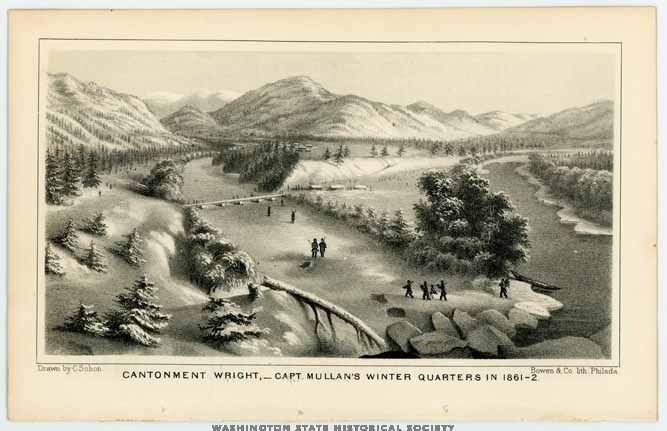 Upon leaving the Stevens Expedition, Mullan was assigned the difficult task of building a military road spanning over 624 miles, connecting Fort Benton in Montana, to Fort Walla Walla in Washington. This was no easy feat. Although Mullan and his men began surveying for the road in 1853 with the intention of constructing portions the following year, conflicts between native tribes escalated. Despite his relatively positive reputation with local Indians, Mullan led a band of Nez Perce during Colonel George Wright’s Campaign 1858, and witnessed the infamous actions at Horse Slaughter Camp. The Oregon Statesman called him the “bombastic little lieutenant.” Some in the region were suspicious of Mullan’s efforts. When construction finally started in 1859, Mullan and his crew of 230 faced complication after complication. Horrific winters, flash floods, and tribal disputes often interfered with the construction of the road. Almost as soon as it was completed, portions began eroding away. For settlers that choose to take the military road, some noted sections completely only passible by foot. Still, the road was a feat in engineering, creating a real northwest passage. Today Interstate 90 mirrors a large portion of Mullan’s route, attesting to his skills as a surveyor and engineer. Upon completion of the road, Mullan married his sweetheart, Rebecca. Mullan left the military service and started a ranch in Walla Walla. Unfortunately, the farm only lasted one year. Mullan then dabbled in a stagecoach business before settling on practicing law in California. Mullan attained success representing various Western states against the federal government in land disputes. The success he gained did not last. In 1878 the Mullans moved back to Washington DC where he spent the rest of his life attempting to fight the states he had represented for the fees he believed he was due. Mullan died in 1909 leaving behind his three adult children. 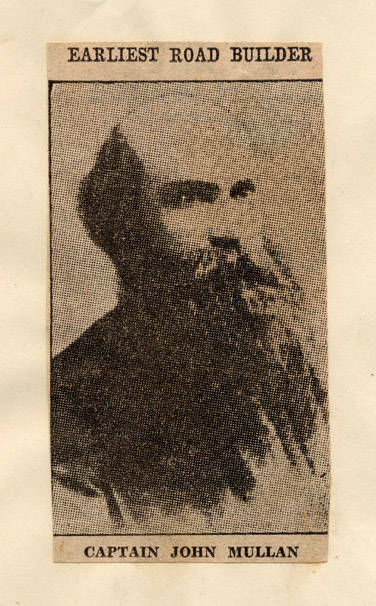 Though he was unable to maintain the prosperity that he so desired, Mullan is still remembered today for his contributions to the military road from Fort Benton, Montana to Walla Walla, Washington. 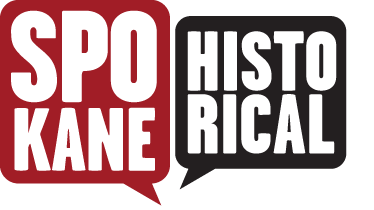 Allie Honican and Anna Harbine, “Captain Mullan: The Bombastic Little Lieutenant,” Spokane Historical, accessed April 20, 2019, https://spokanehistorical.org/items/show/568.